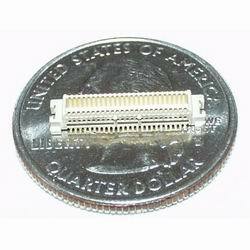 This is the Molex SMD connector that interfaces to the GM862 Cellular Modules. If you're prototyping with the GM862, you pretty much have to have one of these. Watch out, it's 0.5mm pitch, 50-pin, SMD connector. You can solder it by hand, but you'll need some experience, solder wick, and a decent iron. You can also reflow it with a hot-plate and a stencil. If you're not comfortable soldering it, there are breakout boards and designs available from SFE. The dimension stuff can be found on page x of the hardware datasheet. This page was last modified on 10 November 2007, at 17:52.